What kind of unit can I put on my Phase 7 lot? Park Models and Park Model Cottages can be placed in Phase 7. They can be moved in or stick-built on site. Motor homes, trailers and 5th wheels are not permitted in Phase 7. There are several manufacturers and contractors who will custom build, according to your specifications. 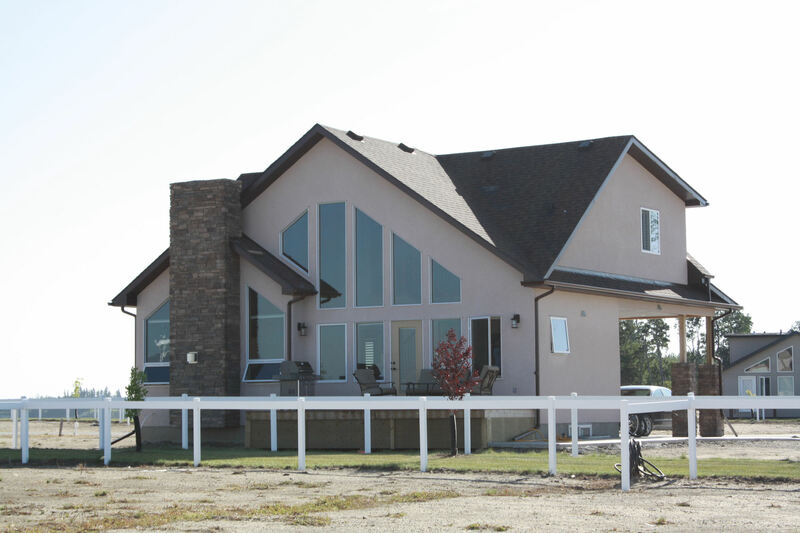 Red Deer County must approve all construction and a development permit must be obtained prior to construction. There are no time constraints related to building a structure or placing a park model on your lot. Once construction begins, there is a one (1) year completion requirement. Typical lots are a minimum 45′ wide x 80′ deep. Services provided to the property line include: year round water & sewer, 220/100 amp electrical, natural gas, telephone, cellular service, and high speed wireless internet available through local providers. Yes, lot owners pay annual maintenance fees as determined by each owners’ Board of Directors in an Annual Budget. These cover all expenses related to maintaining common areas, landscaping, security, management, roadway maintenance and snow removal, garbage disposal, water and sewer, etc. A portion of the maintenance fees is allocated to a Reserve Fund in accordance with the Resort’s engineered Reserve Fund Study. This past year, Phase 7’s condominium fees were $151.42 per month ($1,817 per annum). Water and sewer are included in your maintenance fees. Electricity is individually metered and billed by an electrical retailer of your choice. Natural gas for Phase 7 is provided by a local gas coop. Smaller BBQ tanks can be filled on-site at the General Store. What about Water & Sewer? We have our own state-of-the-art Treatment Plants for both. On staff is an Alberta Government Certified Level II Water/Wastewater Operator who oversees both. Our wastewater effluent is pure enough that we are able to use it for irrigation of the golf course. Our drinking water is the envy of our region and is carefully monitored in our on-site laboratory. Daily samples are tested and recorded, weekly samples are sent to the Alberta Government Laboratory, and bi-annual samples are sent to an independent laboratory. Alberta Environment does regular inspections of our facilities and records. 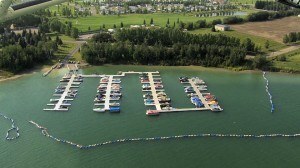 Gleniffer Lake Resort & Country Club is a secure, private, gated community. Keyed access is allowed to lot owners only. We do not operate as a campground. The only people inside the Resort are the owners and their guests and friends. All non-residents must register at the office upon arrival. We have a resident manager on site year round; commissionaires provide on-site security. Our Resort is a safe and secure environment for young families and mature couples alike. Certainly. All we ask is that they register at the main gate on their way in. You are welcome to have guests stay overnight with you in your unit. Am I permitted to rent/lease my lot out when I’m not using it? Certainly, it is after all your lot. However, we discourage overnight rentals as this creates more traffic and promotes a campground atmosphere, which is contrary to the lifestyle of the Resort. We recommend weekly, monthly, or even yearly leases. Am I permitted to bring pets? Certainly, to a limit of two (2) per lot. You are responsible for their conduct and for cleaning up after them. Dangerous or nuisance animals are not tolerated for everyone’s safety and peace of mind. Yes, we have a laundromat at the Clubhouse for your convenience. Our onsite General Store carried a wide range of supplies. A larger range of supplies can be found at Spruce View, which is 3.5 miles from the Resort. Spruce View has a grocery store, hardware store, gas station, bar, restaurant, liquor store, and motel. What is the Golf Course like? How much does it cost? 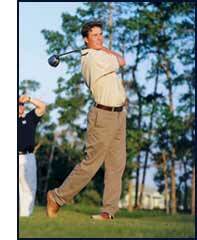 Our Golf Course is a challenging Par 36 measuring 3,300 yards in length. There are 8 water hazards and plenty of bunkers to test your skill. We also have putting greens for practice. Each hole has 4 sets of T-boxes with 2 – Par 3’s, 5 – Par 4’s and 2 – Par 5’s. The Course is open to the Public. We also have an Executive Mini-Links course which is an excellent practice and training course for young and old alike. When you purchase a lot, you obtain an “initiation certificate”, which entitles you to certain golf course privileges. Fees are charged for golf play and there are several different methods and programs by which lot owners can pay and play. For more detailed information, please contact our Pro Shop or see our Golf Course site. Is there a Golf Practice Facility? There are Practice Putting Greens and a new 675 yard Par 3 Mini-Links course to help sharpen your short game. Is there anything to do during Fall and Winter? Yes, and because you have services year-round we encourage you to use the Resort as often as you can. We keep the roads ploughed in the Winter so access is never a problem. Weather permitting, we intend to use the golf course as a cross-country circuit and the lake for skating, ice fishing, and snowmobiling. The clubhouse facilities are always open so you can finish your day with a game of billiards, a work out in the fully equipped fitness room, or go for a swim or soak in the hot tub. What amenities are there? Are there user fees? The clubhouse is open every day of the year with indoor heated pool and hot tub, fully equipped fitness room and billiards/TV room. During the summer, we have an outdoor pool at the clubhouse, and an additional pool facility with outdoor pool and hot tub on the west side of the Resort. 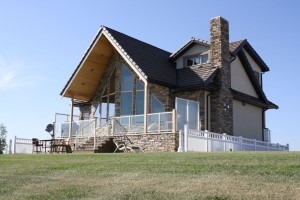 There are no user fees for the pools, tennis course, fitness room, billiards/TV room and boat launch. As well, we have a licensed lounge and restaurant (open seasonally). What is the Gleniffer Lake like? Gleniffer lake is a clear, deep, pristine lake fed by the Red Deer River. There are no restrictions on the type or size of watercraft permitted on the Lake. There is limited public access, so unlike most other lakes in Central Alberta, the lake is not overly busy. The Lake is “man-made”, with a constant change of fresh water, so it is exceptionally clean. Gleniffer Lake is great for all types of water sports! We have our own private boat launch for exclusive use by our owners. There is no cost for the use of the boat launch! 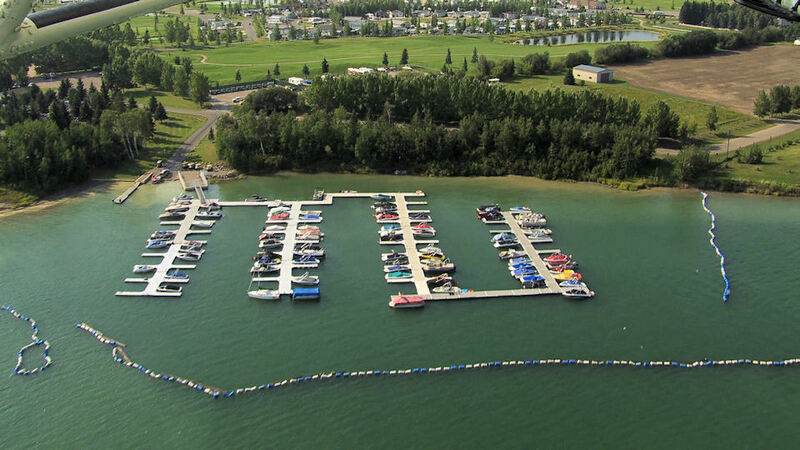 We have 148 marina slips in our marina. There are still some slips remaining for rent or purchase, for those owners who desire the convenience of not having to pull their boat out after every use. If you need more information, call us.